What is Creature Courage? Creature Courage is professional and effective animal phobia therapy using a variety of proven phobia techniques in a fun and interesting way. We at Creature Courage know how debilitating and embarrassing an animal phobia can be. It can be so frustrating when others do not understand that you can’t just “get over it” as this is an issue that is deeper than what you can simply rationalize. You are not alone. You would be surprised about how common these phobias are. And we are here to support you and achieve a liberating change that you may have never thought possible in just a few hours! We are passionate about making a positive difference in people’s lives! We run fun experience workshops and one on one therapy to powerfully change your life and to overcome common animal phobias. Our therapy is carefully designed with our skilled psychologists and hypnotherapists to effectively change mindsets to break free of phobias, fears, and anxieties around animals. The therapy is designed to not only be life-changing, healing and educational but also interesting and exciting! We use a combination of education, art therapy, cognitive therapy, NLP techniques, hypnotherapy and an immersive therapy option to achieve our incredibly high success rate. The techniques we teach you can help you build overall confidence and stay in control of your emotions in any stressful situation you may face in life. We run regular spider phobia workshops as it is the most common animal phobia. You can book our Spider Courage Experience on our Booking Page. If you would like to arrange some private therapy for other animal phobias or book a private group therapy session, please contact us and let us know how we can help you. 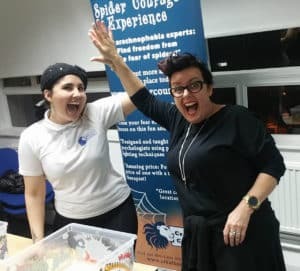 Check out some powerful testimonials from our famous Spider Courage Experience workshop in this video. Do I have to see or touch an animal to do the therapy? Absolutely not. This is an optional choice to do at the end of the therapy to prove your therapy has actually worked. It is also one of the most powerful ways to assure an animal phobia is cured so we, of course, provide this option to give our clients every opportunity to get the results they want. No pictures, video or live animals are shown before an agreed immersive session. Get rid of your fear for good. We are the leading animal phobia specialist in the country so we know what we are doing. If you are determined to get rid of your phobia we will work with you to achieve the results you want! Experienced and qualified therapists who work with celebrities and athletes to build confidence. Your treatment will be of the highest quality! An opportunity to get rid of your fear of an animal in one afternoon in a FUN way. Even if you only have a mild fear our workshops and therapies will be of great benefit. You are in complete control of your therapy and are supported to take it at your own pace. A range of different powerful phobia fighting techniques to assure one will resonate with you. Immersive therapy option. Proven to be the most effective way to heal phobias and fears, our unique treatment gives you the option to face your fear after the therapeutic techniques if you so choose. This is to prove the phobia is really gone! We take every measure and care to assure this is a calm and positive experience! This is what makes us stand out from most other phobia therapy. You are not forced to do this and you have a choice to not see or touch an animal if you do not want to. Build overall confidence and learn skills to overcome anxiety in your life! All the techniques you learn to change your animal phobia can applied to anything stressful in your life so you can continue your growth on a phobia-free life and maintain your new found freedom. This information is invaluable as you can use it to handle any stress in life and become more in control of your emotions overall. Fantastic and convenient central London locations. What if I can’t make my session, will I get a refund? All sales are final but we can reschedule your appointment with the next available space if you give us 24 hours notice by text or email of not being able to make it. In the unlikely event that something happens on our end where we have to cancel your course we will refund you in full or move your session to another date.